In Episode 123 Bryce Dunn, Chris Williams and Manuel Veth discuss Bundesliga matchday 30. They talk about the relegation battle and the race for the European spots. They also chat about Niko Kovac’s future at Bayern and the DFB Pokal semifinals. In Episode 119 Bryce Dunn, Chris Williams and Manuel Veth are joined by Andy Wales to talk about the Bundesliga results in the UEFA Champions League. They discuss whether the Bundesliga is in crisis and what sort of measures the league needs to undergo to improve. Finally, they chat about the German national team ahead of Serbia and Netherlands. In Episode 118 Bryce Dunn, Manuel Veth and Chris Williams discuss matchday 25. They chat about Joachim Löw’s decision to no longer nominate Mats Hummels, Jerome Boateng and Thomas Müller. They also discuss Bayern’s act of defiance reaction against Wolfsburg and taking the league lead from Dortmund. In Episode 117 Bryce Dunn, Manuel Veth and Chris Williams discuss matchday 24. They chat about Borussia Dortmund possibly dropping the hot potato in the title race. Furthermore, they talk about Bayern being resurgent and the relegation dogfight. In Episode 116 Bryce Dunn, Manuel Veth and Chris Williams discuss matchday 23. They chat about the crisis at Schalke, with Christian Heidel gone, will Domenico Tedesco be next? They also chat about Bayern’s transfer offensive, Dortmund bouncing back and the relegation battle. In Episode 115 Bryce Dunn, Manuel Veth and Chris Williams discuss matchday 22. They dissect Bayern’s 3-2 victory over Augsburg and what it means for Bayern going forward. They also chat about Tyler Adams’ Leipzig and their win against Stuttgart. Finally, they discuss Borussia Dortmund’s mini-crisis. In Episode 113 Bryce Dunn, Manuel Veth and Chris Williams round up Matchday 20. They discuss Bayern and Dortmund dropping points in the title race. Also how Tyler Adams once again was a shining light for RB Leipzig, plus their first ever Bundesliga ‘Team of the Week’. In Episode 112 Chris Williams and Manuel Veth round up a busy Bundesliga winter transfer window. Breaking down all the transfers they give their assessments on who has done well and who hasn’t. They also take a closer look at some of the new faces that will break into the league in the second half of the season. In Episode 109 Bryce Dunn, Manuel Veth and Chris Williams are joined by Fox Soccer’s Keith Costigan as they dissect a busy winter break and cast a light on the US talent flooding into the Bundesliga. They also discuss Christian Pulisic joining Chelsea and Bayern landing Benjamin Pavard. In Episode 108 Bryce Dunn, Manuel Veth, Chris Williams and James Thorogood discuss the first half of the season. They also chat about Bayern potentially making key deals during the winter break, Dortmund rebounding from their defeat and Peter Bosz replacing Heiko Herrlich in Leverkusen. Finally, they also hand out their mid-season rewards. In Episode 107 Bryce Dunn, Manuel Veth and Chris Williams discuss matchday 15 of the Bundesliga. They also chat about the recent Champions League draw that will see the three German teams face English opposition. Finally, they also discuss the upcoming Englische Woche in the Bundesliga. In Episode 106 Bryce Dunn, Manuel Veth and Chris Williams chat about the Bavarian Derby between Bayern and Nürnberg and whether the record champions are back on track. They also break down the Revierderby between Schalke and Dortmund. In Episode 104 Bryce Dunn, Manuel Veth and Chris Williams discuss a 36 goal matchday in the Bundesliga. They dissect Bayern’s 3-3 draw against Fortuna Düsseldorf and whether Niko Kovac will keep his job past the winter. They also discuss Borussia Dortmund going nine points clear of Bayern and whether they will win the title. In Episode 103 Bryce Dunn, Manuel Veth, Chris Williams and Matthew Marshall recap one of the greatest Klassikers in recent memory. Furthermore, the chat on what will be next for Bayern and whether the title is Dortmund’s to lose. Finally, they discuss the title challengers Gladbach, Leipzig and Frankfurt. In Episode 101 Bryce Dunn, Manuel Veth, and Chris Williams discuss super Jadon Sancho’s performance against Hertha Berlin. They also chat about Bayern being back on track and whether Alphonso Davies can become the Canadian Sancho. Finally, they also chat about Leverkusen being back on track, the end of the Monday night fixtures and the Bundesliga flying in Europe. In Episode 100 Bryce Dunn, Manuel Veth, Chris Williams and Archie Rhind-Tutt chat about Bayern’s epic press conference and the fallout in the German media. They also discuss whether Borussia Dortmund could win the title. They also chat about Eintracht Frankfurt’s Luka Jovic, Werder Bremen and Union Berlin’s proposal to increase the league to 20 teams. In Episode 99 Matthew Marshall, Manuel Veth and Chris Williams discuss Bayern descending into full-on chaos and Borussia Dortmund flying high. They also chat about Eintracht Frankfurt’s fantastic run, Hoffenheim slumping, Nürnberg being taken apart by RB Leipzig and Werder Bremen enjoying a nice renaissance. In Episode 98 Bryce Dunn, Manuel Veth, Chris Williams and Matthew Marshall discuss the results of the Englische Woche and Bayern dropping five points in two matches as well as Dortmund going to the top. They also chat about the upcoming Champions League matches and the fan protests that took place in the stadiums and even on television. In Episode 97 Hal Stewart, Manuel Veth, Chris Williams and Matthew Marshall discuss the Europa League and Champions League results. They also chat about Hoffenheim’s rivalry with Dortmund and also about high flying Hertha Berlin as well as the upcoming Oktoberfest derbies in Munich. In Episode 96 Bryce Dunn, Manuel Veth, Chris Williams and Matthew Marshall discuss a wonderful Matchday in which late goals and drama paved the way for some remarkable results. Dortmund, Frankfurt, Bayern and Leverkusen – as well as surprise packages Hertha and Wolfsburg – get the treatment from the panel. In Episode 95 Bryce Dunn, Manuel Veth and Chris Williams discuss Germany’s friendlies against France and Peru. Have we seen enough from die Nationalmannschaft to be positive about the future? They also chat about Roman Weidenfeller’s retirement, preview the upcoming Bundesliga matchday and chat about Oktoberfest shirts. In Episode 94 Bryce Dunn, Manuel Veth, Matthew Marshall and Mark Lovell discuss Bayern’s dominance over the league and whether anyone can challenge them this year. They also discuss BVB’s stumble against Hannover, RB Leipzig finally signing someone and Germany hosting France in the UEFA Nations League. In Episode 92 Bryce Dunn, Manuel Veth and Constantin Eckner break down the upcoming Bundesliga season. They predict the top four, the middle of the pack and the relegation candidates. They also chat about the DFB Pokal matches and what tactical innovations we can expect in the upcoming season. In Episode 91 Hal Stewart, Manuel Veth and Chris Williams chat about Bayern demolishing Eintracht Frankfurt in the DFL Supercup on Sunday. They also chat about Frankfurt’s future, Thilo Kehrer’s transfer to PSG and Sebastian Rudy potentially joining RB Leipzig. Finally, they also preview the first round of the DFB Pokal. Gegenpressing – Bundesliga Podcast – Axel Witsel to Dortmund. Done! In Episode 90 Bryce Dunn, Manuel Veth and Chris Williams chat about Borussia Dortmund finally getting the Axel Witsel deal over the line. They also chat about Ralf Rangnick’s plans with RB Leipzig, a culture change at Mainz, Bayern selling Vidal and the latest from Bundesliga 2 and Liga 3. Gegenpressing – Bundesliga Podcast – Alphonso Davies to Bayern. Done! In Episode 89 Bryce Dunn, Manuel Veth and Chris Williams chat about Bayern and Dortmund rounding up their United States tours. They also spoke to Alphonso Davies following his landmark transfer to Bayern München. They also chat Liga 3 and the preview the upcoming Bundesliga 2 season. In Episode 88 Hal Stewart, Manuel Veth and Chris Williams kick off the first Gegenpressing Podcast of the season. The guys discuss the fallout of Germany’s national team performance at the World Cup, the German teams at the International Champions Cup and Alphonso Davies potentially joining Bayern München. In Episode 86 Bryce Dunn, Manuel Veth and Chris Williams discuss Eintracht Frankfurt’s glorious DFB Pokal victory over Bayern München. Manu and Chris spent the week in Berlin where they attended various events surrounding the final and the match itself and they recount the good, the bad and ugly from the German capital. Finally, they also discuss the relegation playoffs between Wolfsburg and Kiel. In Episode 85 Manuel Veth and Chris Williams are in Berlin to bring you are very special podcast live from the Olympiastadion. The two preview the DFB Pokal final between Bayern and Frankfurt. They also recap Hamburg’s dramatic relegation, as well as everything else from the final matchday in the Bundesliga and Bundesliga 2. In Episode 84 Bryce Dunn, Manuel Veth and Chris Williams recap matchday 33 of the Bundesliga and look ahead to all the excitement of matchday 34. They also chat about the first transfers of the season and Bundesliga 2 where the relegation battle involves seven clubs. In Episode 82 Bryce Dunn, Manuel Veth and Chris Williams discuss Bayern’s amazing form ahead of their Champions League clash against Real Madrid. They also chat about Dortmund’s resurrection against Bayer Leverkusen and Hamburger SV fighting their way back into the relegation battle. In Episode 81 Bryce Dunn, Manuel Veth and Chris Williams discuss Bayern signing Niko Kovac to take over as head coach next summer. They also discuss the Revierderby and wonder whether Borussia Dortmund will make the Champions League. Finally, they also chat about the relegation battle. In Episode 80 Bryce Dunn, Manuel Veth and Chris Williams discuss Bayern wrapping up their sixth Bundesliga title in a row in what has been a fantastic achievement by head coach Jupp Heynckes. They also discuss whether Bayern could win another treble. Finally, they talk about the race for Europe and the relegation battle. In Episode 79 Bryce Dunn, Manuel Veth and Chris Williams discuss Bayern obliterating Borussia Dortmund in the Klassiker. Given Bayern’s performance are they now the favourite to win the Champions League? As for Dortmund what needs to be done to get the Yellow and Blacks back to the top of the Bundesliga? In Episode 78 Bryce Dunn, Manuel Veth and Chris Williams discuss Germany’s friendlies against France and Brazil. They also discuss Thomas Tuchel’s future and also chat about coaching changes at Borussia Dortmund and Bayern. Finally, they also preview the Klassiker between Bayern and BVB. In Episode 77 Bryce Dunn, Manuel Veth and Chris Williams discuss the big Sunday night fixture between RB Leipzig and Bayern, as well as Naby Keïta’s outstanding performance. They also discuss Eintracht Frankfurt and why Champions League football could be crucial for the club’s next step. In Episode 76 Bryce Dunn, Manuel Veth and Chris Williams discuss Marco Reus’ contract extension and what it could all mean for Dortmund’s future. They also discuss Per Mertesacker’s interview and assess Hamburg firing their second coach of this season. In Episode 75 Bryce Dunn, Manuel Veth and Chris Williams look at the Bundesliga relegation battle and the likely relegation of both Hamburg and Köln. They also discuss the big game between Leipzig and BVB as well as Max Meyer’s future at Schalke 04. In Episode 74 Bryce Dunn, Manuel Veth and Chris Williams discuss the Monday night fixture and the decision by Borussia Dortmund fans to boycott the game against Augsburg. They also spoke about RB Leipzig and BVB’s performances in the UEFA Europa League and the round of 16 draw. In Episode 73 Bryce Dunn, Manuel Veth and Chris Williams discuss the Monday night game between Eintracht Frankfurt and RB Leipzig as well as the controversy surrounding that fixture in particular. They also talk about the ongoing Eintracht Frankfurt revolution and the club’s chances of reaching the Champions League next season. In Episode 72 Bryce Dunn, Manuel Veth and Chris Williams discuss whether Peter Stöger is the right man to take Borussia Dortmund forward. They also discuss the upcoming Europa League matches and whether the league needs to change its format. In Episode 70 Bryce Dunn, Manuel Veth and Chris Williams discuss the ongoing Pierre-Emerick Aubameyang transfer saga and Dortmund’s problems on the pitch. They also discuss the coaching change at VfB Stuttgart and Eintracht Frankfurt’s football revolution. In Episode 69 Bryce Dunn, Manuel Veth and Chris Williams discuss Leon Goretzka decision to join Bayern München and the reaction by Schalke 04 fans. They also discuss Eintracht Frankfurt’s surge up the table and the Pierre-Emerick Aubameyang situation. In Episode 68 Bryce Dunn, Manuel Veth and Chris Williams discuss Pierre-Emerick Aubameyang’s future and whether Borussia Dortmund should sell him. They also discuss Frank Ribery’s and Arjen Robben’s future and whether Bayern should sign them to new contracts. In Episode 67 Bryce Dunn, Manuel Veth and Chris Williams review some of the big transfers including Mario Gomez to Stuttgart and Sandro Wagner to Bayern. They also chat about all the other transfers including Bayern’s potential deal to sign Leon Goretzka for next summer. In Episode 66 Bryce Dunn, Manuel Veth and Chris Williams review a fantastic year of German football in their 2017 review special. They identify the coach of the year, the player of the year and young player of the year. They also make some predictions for next season. In Episode 65 Bryce Dunn, Manuel Veth and Chris Williams are joined by Matze Kehl to discuss Borussia Dortmund’s recent coaching change from Peter Bosz to Peter Stöger and whether Julian Nagelsmann will become the long-term solution for the Yellow and Blacks. They also discuss Sandro Wanger’s transfer from Hoffenheim to Bayern and what will happen to Hoffenheim’s Mark Uth. In Episode 64 Manuel Veth, Chris Williams and Jon Mackenzie discuss Peter Bosz being sacked by Borussia Dortmund and replaced by former Köln head coach Peter Stöger. They also chat about Bayern’s 3-1 victory over Paris Saint-Germain and they got an interview with Hertha keeper Jonathan Klinsmann. In Episode 62 Bryce Dunn, Manuel Veth and Chris Williams discuss the sensational Revierderby between Borussia Dortmund and Schalke 04. They analyse what will happen to BVB head coach Peter Bosz and they also discuss the future Bayern München. In Episode 61 Bryce Dunn, Manuel Veth and Chris Williams are joined by Raphael Honigstein to discuss the latest Bundesliga news. They also focus on Honigstein’s new book “Klopp: Bring the Noise” by discussing the high and lows of Jürgen Klopp’s career at Mainz, Dortmund and Liverpool. In Episode 60 Bryce Dunn, Manuel Veth and Chris Williams chat about the recent friendly between England and Germany as well as the possible future of German national team player Emre Can. They also discuss Mats Hummels’ comments on Bayern’s possible future coach and the situation at Kaiserslautern. In Episode 58 Bryce Dunn, Manuel Veth and Chris Williams discuss Werder Bremen’s leadership issues and what needs to be done to get the club back on track. They also discuss 220 minutes of football between Bayern and Leipzig and Borussia Dortmund’s defensive problems. In Episode 57 Bryce Dunn, Manuel Veth and Chris Williams discuss the big personnel change at 1.FC Köln and what it could mean for the club going forward. The big topic this week, however, is the doubleheader between Leipzig and Bayern, which rings in several matchdays of big football in Germany. In Episode 56 of the Gegenpressing Bundesliga Podcast Bryce Dunn, Manuel Veth and Constantin Eckner discuss the tactical evolution of the Bundesliga and the new competitiveness of German football. They also review the top game between Borussia Dortmund and RB Leipzig and look ahead to the European games. In Episode 55 of the Gegenpressing Bundesliga Podcast Bryce Dunn, Manuel Veth and Chris Williams discuss Germany’s World Cup qualification campaign. They also chat about Bayern signing Jupp Heynckes for a fourth time and who will come in long-term to take over at the Säbener Straße. Finally, they also discuss the Bundesliga top game between Dortmund and Leipzig. In Episode 54 of the Gegenpressing Bundesliga Podcast Bryce Dunn, Manuel Veth and Chris Williams discuss Bayern’s problems after they drop two more points this weekend. They also discuss a bad week for the Bundesliga in Europe and the upcoming World Cup qualifier between Northern Ireland and Germany. Manuel Veth and Chris Williams discuss the surprise sacking of Bayern München head coach Carlo Ancelotti and what could be next for the Bavarian giants. Gegenpressing – Bundesliga Podcast – Is Aubameyang World-Class? In Episode 52 of the Gegenpressing Bundesliga Podcast Manuel Veth, Jon Mackenzie and Chris Williams discuss Dortmund’s 6-1 victory over Borussia Mönchengladbach. They analyse whether Pierre-Emerick Aubameyang is an efficient striker or not. Finally, they touch on Bayern’s 2-2 draw against Wolfsburg and they predict, based on the first six matchdays, what the top four will look like at the end of the season. 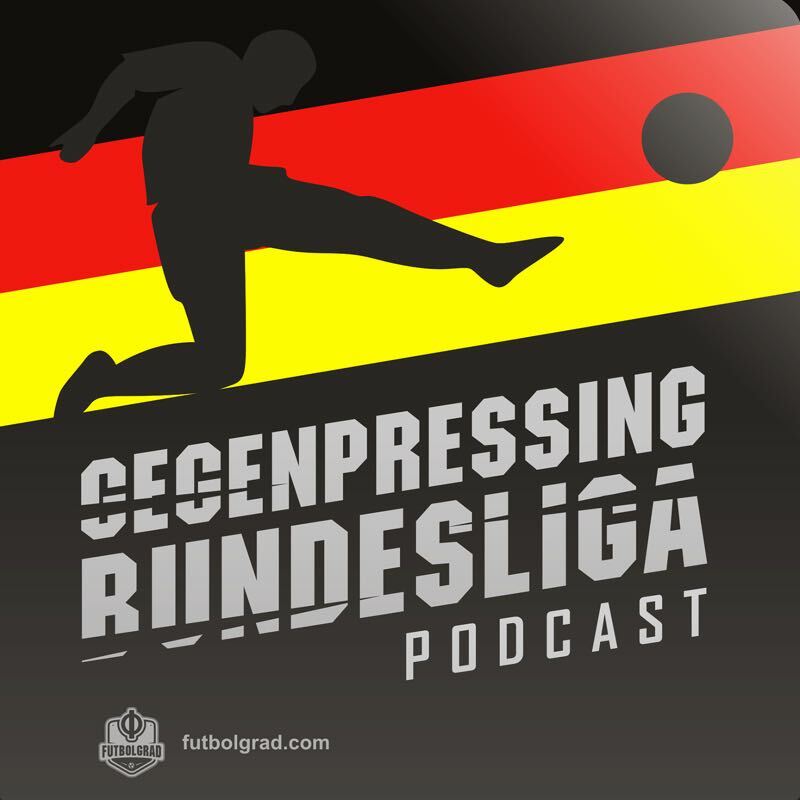 In Episode 51 of the Gegenpressing Bundesliga Podcast Bryce Dunn, Chris Williams and Manuel Veth are once again joined by Jon Mackenzie to discuss the German clubs in Europe and the upcoming Englische Woche in the Bundesliga. They also touch on the Bundesliga top game between RB Leipzig and Gladbach as well as the VAR controversy at Borussia Dortmund vs Köln. In Episode 50 of the Gegenpressing Bundesliga Podcast Bryce Dunn, Chris Williams and Manuel Veth discuss Bayern’s defeat to Hoffenheim and Dortmund dropping points to Freiburg. They also touch on the events surrounding Germany’s game against the Czech Republic and finally they preview the German team’s playing in the Champions League and Europa League this week. In Episode 49 of the Gegenpressing Bundesliga Podcast Bryce Dunn, Chris Williams and Manuel Veth discuss all the Bundesliga transfer deadline deals. Who was brought in and who was sold? We break down all the transfers. In Episode 47 Bryce Dunn, Chris Williams and Manuel Veth are joined by Stefan Buczko to discuss the Ousmane Dembélé transfer saga. They also touch on Hoffenheim’s Champions League playoff match against Liverpool and the latest from Bundesliga 2. In Episode 46 Bryce Dunn, Chris Williams and Manuel Veth look ahead to the 2017/18 Bundesliga season. The boys speak about every club and give their predictions on where clubs will finish and who to look out for in the coming season in Germany. In Episode 45 Bryce Dunn, Chris Williams and Manuel Veth are joined by Jon Mackenzie to discuss the DFL Supercup and the VAR controversy. Jon also speaks about his club Borussia Mönchengladbach and the boys touch on the sporting director change at VfB Stuttgart. Finally, they also talk about the Hoffenheim vs Liverpool Champions League playoff draw. In Episode 44 Bryce Dunn, Chris Williams and Manuel Veth are joined by Jonny Walsh discuss Bundesliga 2. They also touch on Borussia Mönchengladbach, FC Schalke 04 and Hamburger SV’s squad changes and Bayern München’s new sporting director. The boys also managed to talk to RB Leipzig head coach Ralph Hasenhüttl at the Emirates Cup in London. In Episode 42 Bryce Dunn, Chris Williams and Manuel Veth discuss RB Leipzig’s structure and why they are not your average club. They also touch on Pierre-Emerick Aubameyang’s transfer status and James Rodriguez joining Bayern München. In Episode 41 Bryce Dunn, Chris Williams and Manuel Veth discuss Antonio Rüdiger’s move from Roma to Chelsea. They also touch on the Anthony Modeste transfer saga to China and Douglas Costa’s move from Bayern to Juventus. Gegenpressing – Bundesliga Podcast – Germany Triumphant! In Episode 40 Bryce Dunn, Chris Williams and Manuel Veth discuss Germany winning the U-21 European Championship in Poland and the 2017 FIFA Confederation in Russia. They also touch on the Anthony Modeste transfer saga and VfB Stuttgart potentially going all out for a Brazilian wunderkind. In Episode 38 of the Bundesliga Gegenpressing Podcast Bryce Dunn, Chris Williams and Manuel Veth discuss Germany’s involvement at the Confederations Cup. They also touch on Bayern’s latest signing Corentin Tolisso and whether they are in the running to land Kylian Mbappé. In Episode 37 of the Bundesliga Gegenpressing Podcast Bryce Dunn, Chris Williams and Manuel Veth are joined by Susie Schaaf to discuss FC Bayern signing Serge Gnabry and potential future transfers of the club. They also touch on the managerial merry go round in the Bundesliga in the past seven days. In Episode 36 of the Bundesliga Gegenpressing Podcast Bryce Dunn, Chris Williams and Manuel Veth are joined by Max Riegel to discuss the TSV 1860 Munich Case and the 50+1 rule in German football. They also touch on the Naby Keita to Liverpool rumour and all the other latest transfer gossip in the Bundesliga.